Super Savings Item! Save 36% on the Phone Armband Sleeve Best Running Sports Arm Band Strap Holder Pouch Case for Exercise Workout Fits iPhone 5S SE 6 6S 7 8 Plus iPod Android Samsung Galaxy S5 S6 S7 S8 Note 4 5 Edge LG HTC Pixel MEDIUM by E Tronic Edge at DJ Luu. MPN: T1. Hurry! Limited time offer. Offer valid only while supplies last. 【 BRAND NEW 2018 DESIGN 】 - As seen on FOX, NBC, ABC & CBS! Most other phone armbands are bulky, uncomfortable to wear because they have fabric and material that can scratch you or cause irritable chaffing on your skin. Our engineers have resolved this problem by designing an armband that is soft and made more like a compression sleeve. Ensuring that it will be extremely comfortable on your arm no matter your arm size or size of phone you have. 【 5 STARS FOR COMFORT 】- Finally, an armband that you never have to readjust or worry about it slipping during physical activity. Made with quick drying breathable fabric of 85% Nylon and 15% Spandex, you will barely feel the armband on your arm. 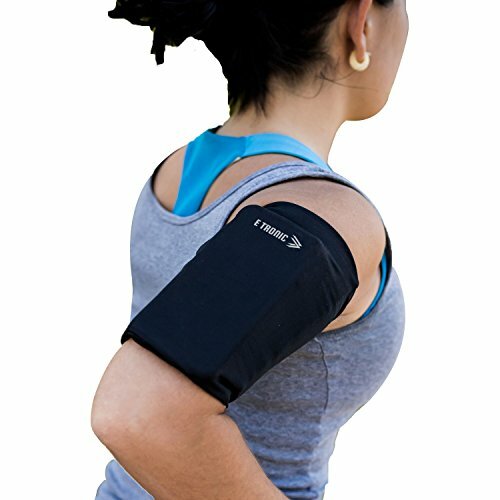 The hugging fit will feel like no other armband you've had before. Please measure your bicep to find out which size is best for you. SMALL <10", MEDIUM 10-14", LARGE 14-16", EXTRA LARGE 16-20". 【 FITS ALL PHONE SIZES & MORE 】- This Armband has enough room to store your phone (no matter the size from 2" to 7") because of its stretchy spandex material. It can even fit more stuff besides your phone. Its a perfect pouch for your keys, wallet, money and more. Now you never have to worry about your stuff when being active. The Armband also has a REFLECTIVE LOGO to keep you safe and seen at night. Stay focused on achieving your goals instead of worrying about cars not seeing you in the dark! 【 E TRONIC EDGE APPROVED 】 - Tired of holding your phone while trying to exercise or doing your daily activities? Worried about dropping your phone and damaging it while you're working out? Good News - our armband has a Velcro opening to make sure your phone will never fall out. You can run your headphone cord through this opening as well. Our great Seller Rating and Armband Rating should help you understand why shoppers prefer purchasing from a trusted customer focused North American Company.